Mexican low-cost carrier VivaAerobus began 2014 on a down note – cancelling a planned public offering valued at roughly USD226 million as it concluded market conditions were too dour and unpredictable to achieve an IPO successfully. The cancellation occurred as VivaAerobus prepared for the first delivery of an Airbus A320. Its acceptance of the new jet marks a pivotal transition from older Boeing 737-300 narrowbodies to similar aircraft operated by its fellow low-cost rivals Interjet and Volaris. VivaAerobus’ decision to shutter accessing the public markets does leave some questions as to how it will finance the 52 Airbus jets it has on order as six of the aircraft are scheduled for delivery in 2014. On a broader scale, VivaAerobus remains the smallest carrier among the four largest Mexican airlines, three of which (including VivaAoerbus) define themselves as low-cost carriers. If the projected rebound in Mexico’s economy fails to materialise during 2014, VivaAerobus’ greater exposure to the domestic market could create challenges for the carrier’s yet-to-be defined strategy for the future. VivaAerobus is the smallest of Mexico's four largest airlines and its three main competitors – Aeromexico, Interjet and Volaris. In comparison to its two low-cost rivals, Interjet and Volaris, its growth during the past few years has been less rapid. All three carriers were created during the mid-2000s as Mexico’s aviation industry was becoming de-regulated. Those airlines along with Mexico’s largest network carrier Aeromexico further seized on growth opportunities after Mexicana’s demise in late 2010. During CY2013 VivaAerobus transported 3.8 million passengers, representing 4% growth year-on-year, according to data from CAPA and OAG. Volaris recorded 20.5% growth, carrying 8.5 million passengers while Interjet’s passengers grew 16% year-on-year during CY2013 to 8.4 million. VivaAerobus is also the smallest among Mexico’s three low-cost carriers in terms of network, offering service to just 27 nonstop destinations (including just one international market, Houston, Texas). Volaris’ network encompasses 46 nonstop destinations, of which 33 are in North America. Interjet offers service to 43 nonstop destinations, including four in Latin America and five in North America. VivaAerobus’ smaller international footprint results in roughly 98% of the carrier’s seats being deployed in the Mexican domestic market. Mexico’s tepid GDP growth of 1% during 2013 resulted in pricing traction virtually eroding in the domestic market. Mexico’s two publicly traded carriers Aeromexico and Volaris recorded a decline in yields for FY2013 of 4.6% and 7%, respectively. Aeromexico’s larger international network (presently for the week of 3-Mar-2014 to 9-Mar-2014, 28% of the carrier’s seats are deployed in international markets) helped that carrier weather the fall in domestic prices. However, Aeromexico during the last year has opted to trade in some decrease in yields to boost loads as a means to increase its domestic market share, which has slipped during the past few years as Volaris and Interjet in particular rapidly grew their respective domestic shares. But VivaAerobus does not have the international network shield that its rivals employ, which means it was likely hit particularly hard by deteriorating domestic market conditions in 2013. But VivaAerobus stands to broaden its share during the next few years. During late 2013 it placed an order for 52 Airbus narrowbodies – 12 current generation A320s and 40 A320neos. About six aircraft are scheduled for delivery in 2014, and VivaAerobus expects to accept the final aircraft from the order in 2021. The carrier expects to phase out its 737-300s in 2016. See related report: VivaAerobus joins Volaris and Interjet in placing large A230 order. Can Mexico sustain all three? As previously reported by CAPA, the aircraft VivaAerobus has on order could result in the carrier tripling its capacity by the end of 2021. Its current older 737-300s are configured with 148-seats, which result in 2,812 seats across its fleet. Logic dictates that VivaAerobus is likely to operate its A320s in a high-density configuration of 180-seats, which would supply 9,360 seats across all aircraft. Among Mexico’s newer low-cost carriers, Interjet has more of a hybrid model, offering a less-dense 150-seat configuration on its A320s. It appears to target more business travellers than Volaris and VivaAerobus, which bill themselves as pure low-cost carriers. Volaris has dubbed itself an ultra low-cost carrier and believes ancillary revenue, largely from baggage and onboard food sales, will drive margin expansion in 2014. All of Mexico’s low-cost carriers along with Aeromexico are vying for passengers that are opting to switch from bus to air travel, which is now affordable to Mexico’s growing middle class. Whether the Mexican market can sustain three low-cost carriers and a fully-fledged network carrier is debatable. Perhaps VivaAerobus’ aircraft order is a signal of its intent to grow its scale. During its eight year existence the carrier has largely focussed on operating low-frequency point-to-point flights that initially bypassed Mexico City. It altered that plan in 2010 when it received slots and began operating out of Mexico City Juarez Airport. Mexico City is now VivaAerobus’ second largest base measured by seats on offer. 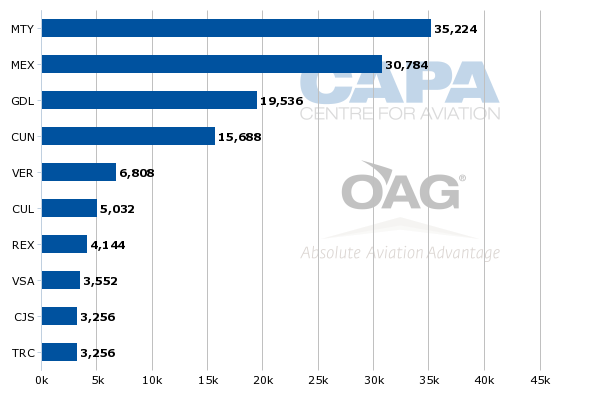 But VivaAerobus is not the top carrier in terms of seats share in any of those markets. It is third in its headquarters city of Monterrey, and also third in Culiacan, Villahermosa and Ciudad Juarez. It is the second largest carrier in Veracruz, Reynosa and Torreon and the fourth largest in two of Mexico’s major markets Mexico City and Guadalajara. Its seat share in its largest bases reflects it low-frequency operations. Once VivaAerobus accepts delivery of all 52 Airbus narrowbodies it will grow by a net 35 aircraft, more than doubling its present fleet of 17 jets. According to the CAPA Fleet Database, Mexico’s other airlines also have ample orderbooks – 73 at Aeromexico, 51 at Volaris, and 50 for Interjet. Obviously some of those aircraft are pegged for international services, but many are also tagged for domestic growth. There is room for stimulation in the Mexican market, but those four carriers are going to keep bumping into one another within the domestic space, which means the low-cost carriers must keep lowering their costs to remain profitable as a low-fare war could erupt within Mexico. Is now the time to leverage more cooperation with VivaColombia? Where VivaAerobus will eventually fall in Mexican airline hierarchy is tough to predict. With just a single international transborder market to the US, there is room for the carrier to spread its wings beyond Mexico. It has served other US transborder markets in the past, but has eliminated those routes from its roster. In late 2013 VivaAerobus CEO Juan Carlos Zuazua told publication El Financerio the carrier was evaluating 20 to 25 routes in Central and South America, which may mean the carrier is looking to expand in routes where it could avoid competition from Mexico’s low-cost carriers in the near to medium term. Since the launch of VivaAerobus’ sister carrier VivaColombia in 2012 (both partially owned by Irelandia Aviation and bus company IAMSA), there has been little coordination between the two carriers. But VivaAerobus’ A320 order could create opportunities for cross-fleeting and more cooperation. With each carrier adopting a pure-play low-cost carrier philosophy, direct codesharing would create unnecessary complexity. But there could be cross-promotion of each carrier’s low-fare product if VivaAerobus and VivaColombia follow through on declarations of international expansion. VivaColombia has previously indicated it would introduce new service from Bogota to Lima and from Bogota and Medellin to Panama City during 2014. VivaAerobus still finds itself trailing its Mexican LCC peers – in search of a long-term strategy? Mexico’s carriers transported roughly 30 million domestic passengers in 2013 compared with 28 million the year prior. With a population of 119 million, stimulation opportunities do exist in the country. But in the short term an expected economy recovery in 2014 may not occur until the second half of the year, which means fares in the domestic market could continue to sag, and result in all carriers likely trading some loads for yields. Presently VivaAerobus’ higher exposure to the domestic market place and the postponement of its IPO could make 2014 a challenging year for the carrier as it works to carve out its place within the Mexican market place over the long term. Its fleet refresh is a necessary step to put VivaAerobus on equal competitive footing with its peers – particularly Interjet and Volaris. But with higher levels of penetration in the domestic market place and growing international networks, Interjet and Volaris still enjoy a fairly sizeable competitive gap in relation to VivaAerobus. Perhaps 2014 is the year VivaAerobus and its owners outline a long-term vision for the carrier and their plans to replicate the Viva model beyond Mexico and Colombia.